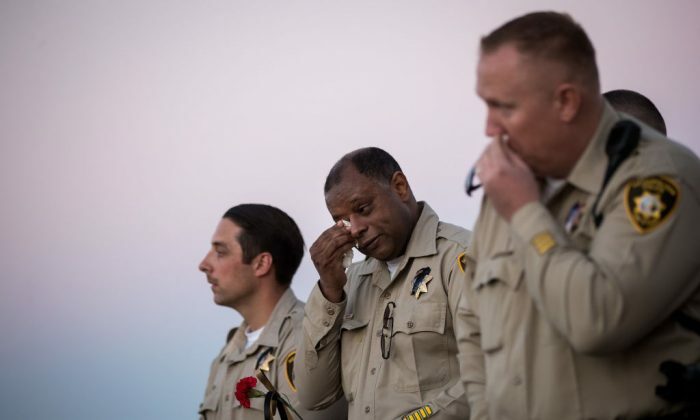 An off-duty Las Vegas policeman and former soldier who was killed in the Las Vegas massacre left a funeral note with instructions. Charleston Hartfield was one of the 58 people killed at a country music festival when Stephen Paddock opened fire from the windows of the Mandalay Bay hotel. Hartfield died trying to get others away from the gunfire during the worst mass shooting in the history of the country. The 34-year-old was buried on Oct. 20, after a funeral that brought 2,000 people, including family, friends, police officers, and military officers. There was also a motorcade down the Las Vegas Strip, Fox News reported. Hartfield, a father of two, began a computer file with instructions for his funeral a year ago. The file was discovered by his wife after the massacre. He wanted to be remembered humbly. “I would like for everyone to enjoy themselves. And remember me for who I was. The truth only. None of that stuff about how great I was. Only real stories,” he wrote. But the people who admired Hartfield did not see it necessary to keep that particular request. Nevada National Guard Brig. Gen. Zachary Doser said Hartfield was “everything good about being an American” at the funeral. Hartfield’s requests show the impression serving in the military left on him. “The only way I would like to be placed in the ground is if it’s in a veteran’s area. That way myself and the crusty old vets can hold formations and continue to protect and serve our great country once more,” Hartfield wrote. Hartfield served in the Army for 17 years, and on a police force for 11 years. Lombardo said he considers Hartfield’s death on-duty, since he was playing the role of protector at the time. The Nevada National Guard honored Hartfield by promoting him to first sergeant.